Not everyone has a few acres or a large greenhouse to grow in, and yet everyone should be able to have their own garden. 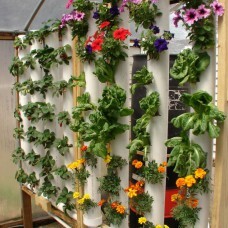 Because of this, we designed a method of gardening VERTICALLY that is easy to build, easy to maintain, and most of all affordable! Each of the 4 pipes have a 9 slits in them that have been bent out by gently heating the pipe to give the plant a place to grow. These pipes are hooked up to a drain that catches all the water sprayed in the top by a small fountain pump. The water recirculates constantly past the plants which are secured stably in an inert growing medium. The water is caught in a reservoir where fertilizer and water are added and the cycle is then repeated. And if you have more space at your disposal there is no reason to limit yourself to one bed; you can easily expand this system to handle hundreds of plants, all in a remarkably small area. Like all our gardening systems, it is incredibly easy to use and requires almost no maintenance compared to every other garden you've ever grown. 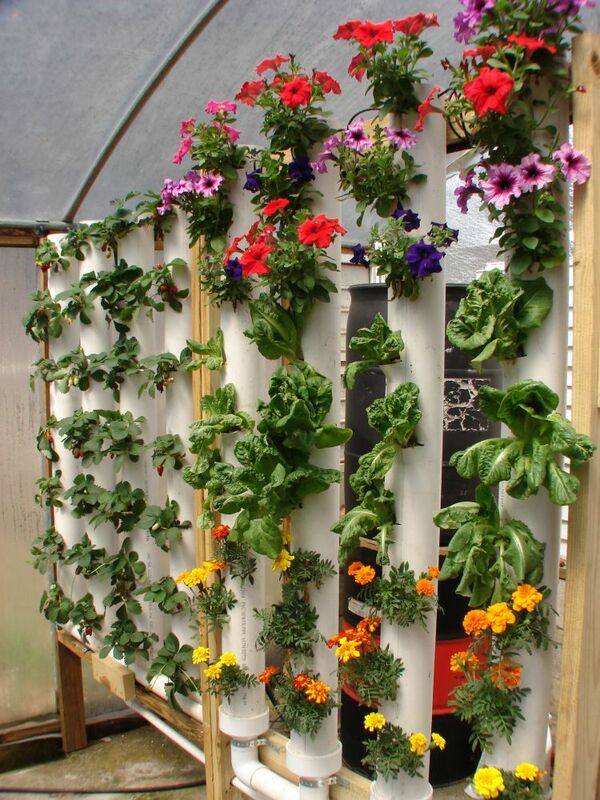 Very little technical skill is required, and with a very affordable investment, a basic knowledge of tools and a few hours you can build a vertical garden to grow dozens of pounds of strawberries, lettuce and herbs right on your patio! Our video lays out the process from start to finish and the accompanying plans provide step-by-step instructions as well as sources for fertilizer and any hard-to-find supplies.